This was a series I worked on for over two years, documenting the visitors to The World Trade Center site and the building of the “Freedom Tower”. I have nothing to add to that day 14 years ago. If you were a New Yorker, or a commuter, living or working downtown, we all share our individual as well as collective stories. I have told mine many times. The world looked on. Many died. Many cried. Many cheered. 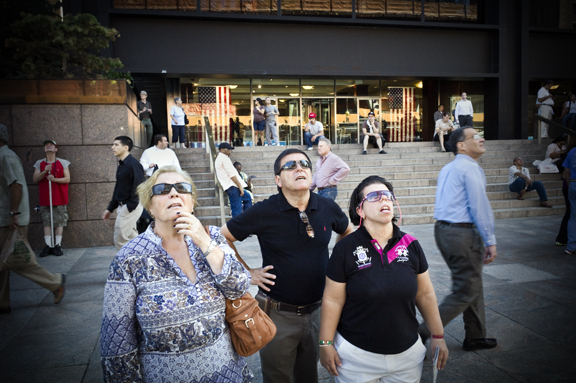 “Looking On, Watching the Building of the Freedom Tower”. This entry was posted in Financial District, New York City and tagged #‎NeverForget‬, #everybodystreet, #Life_On_The_Street, 28mm, black and white, color, Financial District, Freedom Tower, Looking On, Manhattan, New York City, raw streets, street, street candid, street photography, tourists, urban life, World Trade Towers, WTC. Bookmark the permalink. My wife and I watched it all unfold on TV. A year later, we were standing at the corners of Vessey and Church Streets and Broadway,listening to the names being called out of all those lost in the towers. I’ll never forget this and, sad to say but truth be told, time has not healed my scars from witnessing this crime committed against so many. I didn’t know anyone who died but I somehow identify with their surviving families and friends, even if only on a very minuscule level. I need more time to heal. A lot of New Yorkers, people in general, feel the way you do. This is one event that is still an open wound. Every day New Yorkers look up and see a changed skyline.